Speaker Rear Admiral Robert J. Papp, Jr.
Rear Admiral Robert J. Papp, Jr. assumed his current position as the Commander, Ninth Coast Guard District on May 21, 2004. As the region’s operational commander, he leads over 7,700 regular, reserve, auxiliary and civilian men and women, two air stations, two air facilities, five Group offices, eight Marine Safety offices, nine cutters and 46 small boat stations. Under his direction, Coast Guard personnel uphold maritime security over 3,800 miles of shoreline and 1,500 miles of international border and provide the world’s premiere search and rescue, marine safety and environment protection, maritime law enforcement, aids to navigation and icebreaking services to the region’s citizens. Rear Admiral Papp is a 1975 graduate of the United States Coast Guard Academy in New London, CT. He holds a Master of Arts degree in National Security and Strategic Studies awarded by the United States Naval War College in Newport, RI and a Master of Science degree in Management awarded by Salve Regina College, also in Newport, RI. His primary duties in the Coast Guard have been seagoing in nature. He has served in six Coast Guard Cutters and commanded RED BEECH, PAPAW, FOREWARD, and “America’s Tall Ship”- the Coast Guard’s training barque EAGLE. Highlights include service as commander of a task unit in Operation Able Manner off the coast of Haiti in 1994, and enforcing United Nations sanctions during Operation Support Democracy. His task unit grew ultimately to 16 cutters and associated aircraft in support of Naval forces during Operation Uphold Democracy, the U.S. intervention in Haiti. 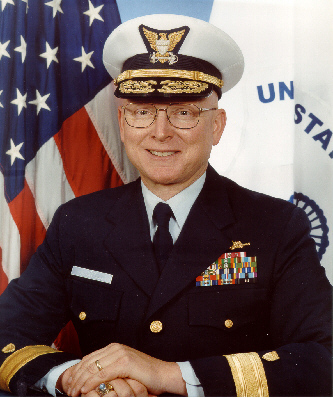 In 1996, while in command of EAGLE, he represented U. S. Naval Services at the 300th anniversary celebration of the Russian Fleet in St. Petersburg, Russia. Assignments ashore have included the Commandant of Cadets staff at the Coast Guard Academy; Aids to Navigation staff in the Third Coast Guard District at Governors Island, NY; Chief of the Capabilities Branch in the Defense Operations Division of Coast Guard Headquarters; Chief of the Fleet Development Team in the Office of Navigation Safety and Waterway Services; Director of the Leadership Development Center; Chief of the Coast Guard’s Office of Congressional Affairs and, Deputy Chief of the Coast Guard.